Today I found this recipe on the my fitness pal website and it sounded so good and something that my family would love. Chicken Parmesan mixed with pasta and lots of cheese? Yes, please! It was delicious! Mix bread crumbs, Parmesan cheese, garlic salt, garlic powder, and pepper. In a small bowl, whisk together egg and milk. Cut chicken tenders into 1.5 inch cubes. Dip chicken cubes in egg/milk mixture, and then roll in bread crumb mixture. In a medium pan heat olive oil over medium heat. Cook chicken pieces until browned, approx. 4 minutes on both sides. While chicken is cooking, prepare ziti per package directions until al dente. Drain and pour into a lightly greased baking dish. Pour spaghetti sauce over pasta, and sprinkle with 1/4 cup Parmesan cheese. Arrange chicken in single layer over pasta. Sprinkle mozzarella cheese over chicken, and bake in oven at 350 F for 25 minutes or until heated through and cheese is melted. Enjoy! OMG this sounds awesome. I think my teenager will LOVE this. Making it tomorrow night for sure. Thanks for sharing, found via mix it up Monday. Awesome! This sounds delicious, never had a chicken parm ziti before. Can't wait to try! This sounds fabulous and I love the calorie count!! I am pretty pumped about this recipe cause chicken parm is my favorite and combine it with ziti is a recipe for success! Pinned to my cooking bucket list. Always enjoy your recipes!! Yum! This sounds so good. I came over from the In and Out of the Kitchen Link Party. This looks good, Bridget! Thanks for sharing at Marvelous Mondays! Pinned! This looks absolutely delicious! 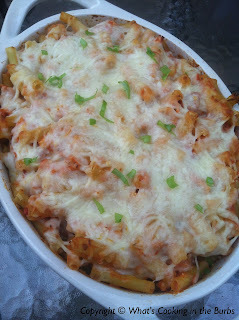 Thanks so much for linking up with "Try a New Recipe Tuesday!" You are being featured this week! Congratulations! :-) The post will go live around 11pm Eastern on Monday evening. I hope you will be able to join us again this week.